Advanced Windows Care Professional Edition is an advanced Windows maintenance and optimization utility. It keeps your PC stable and running at peak efficiency. Continuously repairs system configurations by eliminating system bottlenecks and preventing crashes. Advanced Windows Care pro provides an always-on, automated, all-in-one PC Healthcare Service with anti-spy ware, privacy protection, performance tune-ups, and system cleaning capabilities. 1.The ability to constantly keep your computer safe, error-free and running at its top speed and optimum performance. 2.Keeping your PC error-free and running more smoothly than ever. 3.Advanced WindowsCare Professional Edition is the award-winning, flagship product recommended most often by IT experts and editors worldwide. 4.An "Install It and Forget It" feature that works automatically and quietly in the background on your computer. Iobit Advanced Windows Care available in Professional and Standard versions. The Professional version costs $29.95 and includes additional functionalities like - Automatic update, Exclusive system Tune-Up, Automatic care in background, 24x7 customer support and consent for commercial use. Standard version is free and has limited functionality. 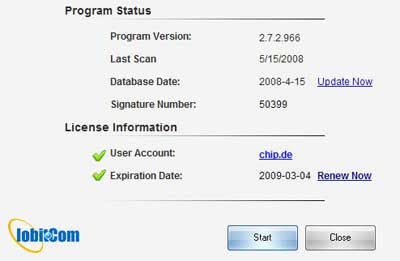 If you like to use commercial version free for one year, here is a promotion from Chip.de Magazine. They provide one year free license to 20,000 users. This is a little older promotion, but it still works. 1. Download the software from here / here (File size 6.99Mb, Version: 2.7.2.0). 2. Install it and provide chip.de as account name and enter 85A945ED1F1A3DE3 in the License code field and leave blank company name field. 3. Required internet connection to validate the account name and license number.